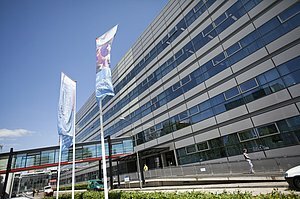 Chemical Engineering and Chemistry is one of the nine departments of Eindhoven University of Technology (TU/e). It was established in 1957, shortly after the university was founded. The department has approximately 500 employees (411 fte), 14 full-time professors, 370 Bachelor's and Master's students, about 145 doctoral candidates and 40 trainee design engineers. The department is located in the Helix and Matrix buildings on the TU/e campus. It has extensive laboratory facilities that occupy 12,000 m2. The department aspires to be an academic institution for education and research in chemical science and engineering of the highest international standard. The aim is to generate and to develop technology and scientific knowledge relevant for the long-term needs of society. Scientific curiosity and the use of newly generated knowledge are the main driving forces behind the continuing enhancement of the chosen fields of expertise. In terms of education the department offers a Bachelor's degree program, a Master's degree program offering two specializations and, at the Stan Ackerman's Institute, a design engineering course. Education is closely related to the department's research, which spans no fewer than 8 research programs. There are two main research clusters within the Department of Chemical Engineering and Chemistry: Molecular Systems and Materials Chemistry, and Chemical and Process Technology.